India is a popular tourist destination and Delhi is a capital of India is preferred by the majority of tourists across the world. But nowadays Delhi is even being acknowledged for its world-class medical treatments offered. Knowing this we at Orion Orthodontic & Dental Care Center offer the perfect combination of traveling with best dental treatments. Our dental clinic gives our patients an opportunity to enjoy the beauty and hospitality of Delhi and avail our Cheap “Dental Implant in Delhi“. Delhi is even well connected with all major international airports around the world and hosts one of the best & largest Indira Gandhi international airports in the world. We at Orion Orthodontic & Dental Care Center are a multi-specialty cheap dental implants clinic in India and have a senior and experienced doctors’ team in our clinic. Our panel of healthcare professionals is committed to providing quality treatments for our patients. 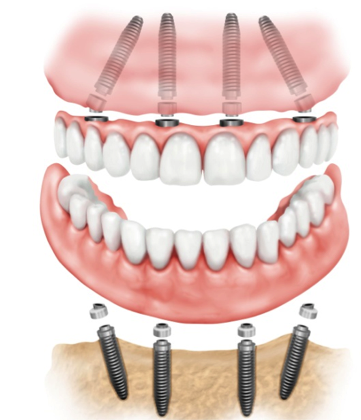 In our treatments, we provide all on four dental Implants in Delhi using the advanced and specialized techniques. We even pay high emphasizes to sterilization of the equipment for patient’s safety. All on four dental implants in a trademark concept developed by Nobel Biocare Dental Implants Company. It is meant to rehabilitate patients who want a full arch replacement with a compromised bone situation. 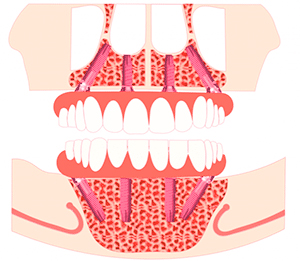 It allows for placement of tilted dental implants which are placed in front of the Sinus in the maxilla avoiding the sinus lift and bone grafting procedure. In the lower jaw also the implants are placed in front of the mandibular nerve. This helps avoid complex and debilitating grafting procedures allowing for faster and sometimes Immediate delivery of teeth. 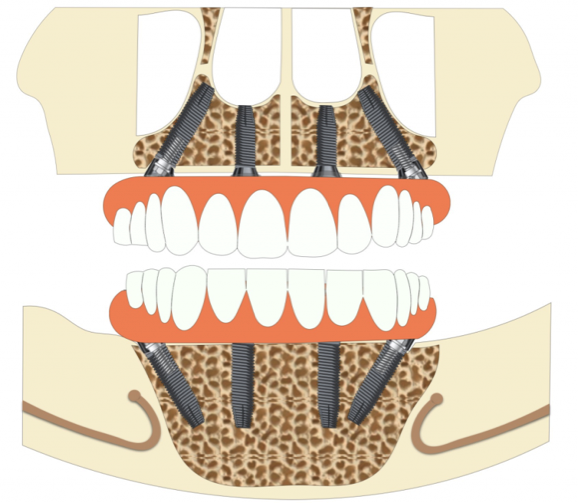 Full arch can be built on four implants( Concept of All on 4 Dental Implants). The bone which lies in the front area of the jaws is used. Complex grafting procedures requiring is avoided. Quick rehabilitation. Immediate loading is possible. The waiting period of 3-5 months for teeth placement not needed. Especially suitable for Dental tourists – teeth within a few days. Milled Framework (Nobel Biocare -Procera Milled Abutment) available which is made in titanium and extremely light in weight. 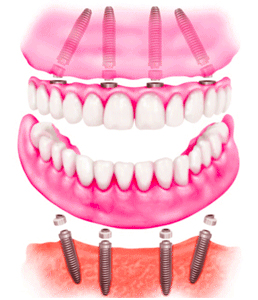 Most precise fit-Increases the long-term success of the implants and the teeth. Time Frame for teeth placement is managed better. Fewer chances of infection as grafts are not placed usually for all on four dental implants in Delhi. Our patients can be stress-free about the dental procedures “All on 4 Dental Implants in Delhi” (Cheap Dental Implants in Delhi) offered at our dental clinic. Our clinic is equipped with the latest dental equipment like a digital dental care X-ray machine and sleep dentistry for patient’s conveniences and comforts.